Einblick und Dialog im Spannungsfeld: Kunst, Forschung, Technologie. Throughout his art practice Matthew Mosher has invited the public to physically engage with his work using the power of human touch. Since Martin Heidegger developed his philosophy of Pheno- menology, designers have applied embodiment to make their projects more meaningful and impactful. This talk will examine how strategies from tangible interaction design can be implemented within the fine arts to create moving experiences for participants, and by doing so empower people to see the world from different perspectives. 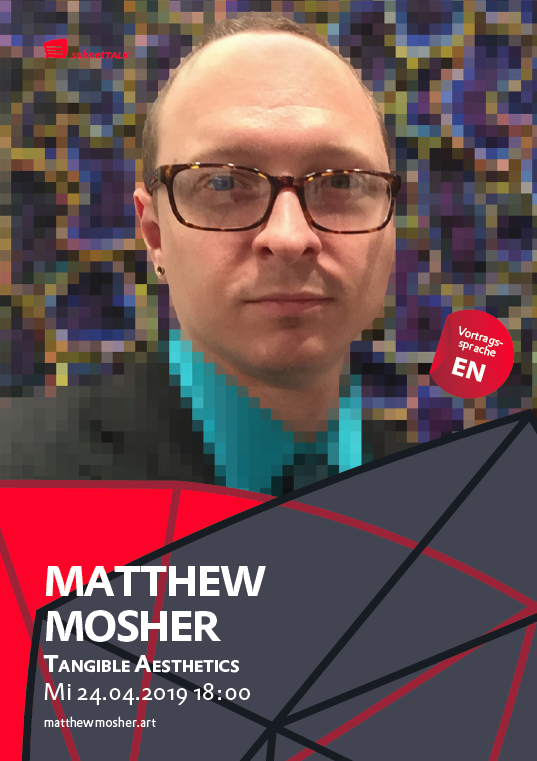 Matthew Mosher is an intermedia artist and research professor who creates embodied experiential systems. He received his BFA in Furniture Design from the Rhode Island School of Design and his MFA in Intermedia from Arizona State University. Currently, he is an assistant professor of games and interactive media at the University of Central Florida and a Fulbright Scholar in Austria. His internationally exhibited artworks bridge the physical and digital worlds by mixing computer programming, collaborative practice, and traditional sculpture processes. eine Stunde – Imput ca. 20 min, Dialog ca. 40 min.